Four gods whose names are Amset, Hepi, Duamutef and Qebehsenuf. They were regarded from as early as the Old Kingdom as the Sons of Horus, meaning Haroeris in the Letopolitan tradition. Together with the Sons of Khenti-irty, they form part of one of the Enneads of Heliopolis. Not much is known about the origins of the four gods. Some texts interpret them as stars; lists of stars from the New Kingdom contain their names and the Book of the Dead says that they are the ones who guard the constellation of Seth (the Great Bear, called the 'ox leg in the northern sky') for Osiris. In general, they take care of the deceased. In the Pyramid Texts from the Old Kingdom they assist the deceased on his journey to heaven. Other texts say that they guard the body during the wake. They were particularly responsible for protecting the internal organs, and as an extension of this had to prevent the deceased from suffering hunger or thirst. 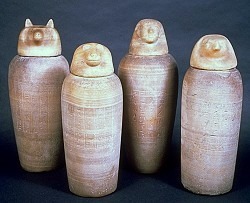 The internal organs, removed from the body during mummification, were stored in four so-called canopic jars. Each of them came under the protection of one of the Sons of Horus. From the late 18th Dynasty on, the lids of these jars were given the shape of the heads of these gods. In many instances the gods are linked with the four cardinal points, including on sarcophagi where they appear from the Middle Kingdom on, on or near the four corners. Representations of the gods, often made of faience, were sometimes placed between the mummy wrappings. In their turn, the gods were helped or protected by four goddesses, Isis, Nephthys, Neith and Selkis, respectively.